1. What is a Lienzo? 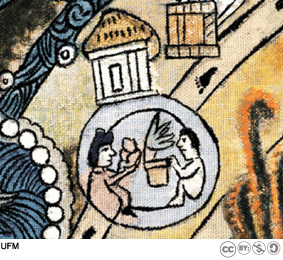 The Lienzo de Quauhquechollan is made up of 15 pieces of cotton cloth that were sewn together. Marketplaces were indicated by a circle with one or more people inside with merchandise. 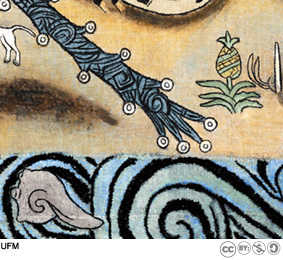 Stylized Nahua images: a river (linear blue glyphs with white dots) and the ocean (wavy blue lines). 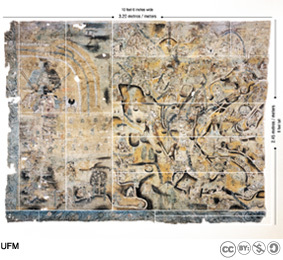 The term lienzo refers to a type of painting on cloth used by the indigenous peoples of Mesoamerica to communicate information. It was a system that combined oral narrations with stylized symbols and standards that were understood by the members of different societies. The word “lienzo” means a panel of cloth in Spanish. 2. How was a lienzo displayed? 3. What kind of cloth was used to make a lienzo? 4. What kind of paint was used? 5. Is a lienzo the same as a codex? 6. How big is the Lienzo de Quauhquechollan?